NEW YORK (CNS) — Against all expectations, Walt Disney took a theme park ride, “Pirates of the Caribbean,” and turned it into a blockbuster film franchise. The result? Disney has done it again. “Tomorrowland” is a delightful science-fiction film and great fun for the entire family. Directed by Brad Bird (“The Incredibles”), who co-wrote the screenplay with Damon Lindelof (TV’s “Lost”), “Tomorrowland” is bursting with optimism and enthusiasm. Its hopeful view of the future is a refreshing contrast to the depressing dystopian vision that has dominated Hollywood films of late. The film borrows the name but little else from the futuristic-themed section of Disneyland and other Disney parks. Instead, there’s a meticulous recreation of the 1964 World’s Fair in New York, which was a showcase of future ideas and innovations. There Disney created the “It’s a Small World” ride to promote global harmony. In the film, it serves as the gateway to the gleaming utopia that exists, “Twilight Zone”-like, in another dimension. Like Alice falling down the rabbit hole, a whiz-kid boy inventor, Frank (Thomas Robinson), takes a detour on the ride into Tomorrowland. He’s lured there by a mysterious girl, Athena (Raffey Cassidy). Her mission is to recruit the best and brightest talent on Earth to learn from a place of peace and promise. Fast-forward 40 years, and something has gone awry. Earth is fraught with problems, including war and natural disasters. Despair fills the air, and the future is far from bright. Casey is a dreamer, inspired by her father, Eddie (Tim McGraw), a NASA engineer. But even NASA is being dismantled, along with Casey’s dream of reaching the stars. Before you can say “Zip-a-Dee-Doo-Dah,” Athena reappears, looking none the worse for wear, for she is actually a sophisticated (and ageless) robot (mirroring Disney’s skill with animatronics). She recruits Casey for a special mission: to save Tomorrowland. The city has fallen under the spell of a coldhearted bureaucrat called Nix (Hugh Laurie), who is responsible for wreaking havoc on earth. Why Casey is the savior is anyone’s guess. With Athena in tow, she looks up Frank, who has aged into the dashing George Clooney. Twenty years ago, Frank was banished from Tomorrowland for threatening to expose the conspiracy. 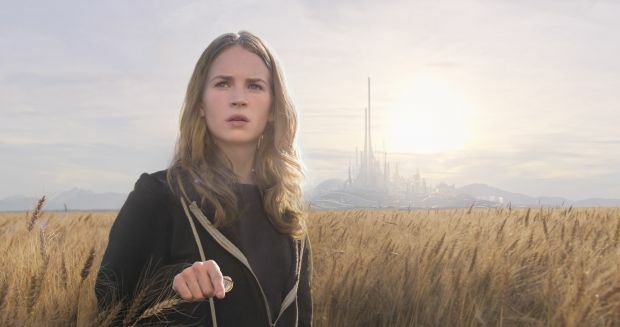 “Tomorrowland” morphs into a buddy movie as man, girl and robot race against time to, literally, save the future. The action sequences in the film have a cartoonish quality, but the ray guns and decapitations (of robots) may upset the younger set. Others will be equally amused and enchanted. The film contains cartoonish but bloodless action sequences and a few mild oaths. The Catholic News Service classification is A-II — adults and adolescents. The Motion Picture Association of America rating is PG — parental guidance suggested. Some material may not be suitable for children.